Greece’s Deepsessions Recordings returns following the Holiday break with their 206th overall release and first of 2013. 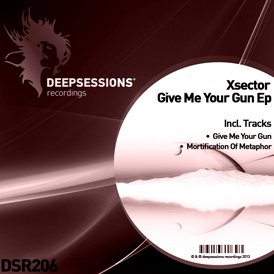 The Georgian duo Irakli Samkharadze and Mikheil Kedelashvili aka XSector make their debut on the label with their “Give Me our Gun” EP which comes with two brand new original productions. The 207th release on Deepsessions is out this week and it features the debut of D Punxx & Lexx to the label. The Bosnian duo are at the beginning of their production career with just one release on Uranobeat Records thus far but their brand of melodic progressive house is starting to catch on as appearances on Hands Up and Bos Tech records are forthcoming. Their debut on Deepsessions is entitled “Velvet Love” and it comes with two brand new original productions. Derek «teig» Roberts is an Atlanta native currently residing in Chicago who has spent most of his life involved with music. Although he discovered electronic music in elementary school, Derek played trumpet and piano both, and still continues to do so, teaching himself complex theory and music perspective in his free time. His long involvement in music matured his taste and perspective, and is still actively shaping his sound to this day.